Kylian Mbappe saved the day for Paris Saint-Germain with two late goals as the Ligue 1 champions came from behind to clinch a 3-1 victory over Guingamp. Following a dismal first-half showing from his side, Thomas Tuchel turned to World Cup winner Mbappe at the interval, and the teenager's introduction paid dividends when he combined with Neymar, who drew a clumsy foul in the area from Jordan Ikoko. Neymar was far from at his best, but duly netted his second Ligue 1 goal in as many games to cancel out Nolan Roux's opener, with Guingamp having been unlucky to have a second disallowed prior to the interval. 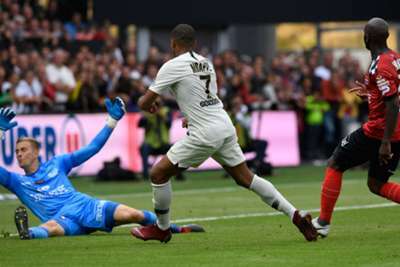 But despite a resilient Guingamp rearguard, Mbappe would have the final say when he twice tucked home in the final eight minutes to keep maintain PSG's 100 per cent start under Tuchel. Having been denied once by a brilliant Gianluigi Buffon save onto the bar, Roux made no mistake in the 20th minute, prodding in his first Guingamp goal. PSG were fortunate not to be further behind before the half hour - Marcus Coco making a fool of Buffon before squaring to Nicolas Benezet to head in - but, after consultation with VAR, referee Clement Turpin disallowed the goal, possibly for a foul on Colin Dagba. Mbappe's introduction immediately buoyed PSG, though, and the visitors were level eight minutes after the interval when Neymar sent Karl-Johan Johnsson from the spot. And France's superstar took matters into his own hands late on - slotting in PSG's second from Angel Di Maria's neat pass before putting the result beyond all doubt with an exquisite chip in the 90th minute. Tuchel's time at Borussia Dortmund was somewhat marred by his defensive frailties, and it looks as though those issues have not gone away at PSG. Thiago Silva and Marquinhos were both dragged out of position far too often, while Coco had the beating of both full-backs, and against better sides - especially in the Champions League - PSG's weaknesses are likely to be punished more often. France's teenage sensation sparkled in Russia, and Mbappe's star seems destined to rise even further this term. PSG looked devoid of ideas until the 19-year-old's introduction, and having teed up Neymar in the build-up to the penalty, the former Monaco forward rounded things off in style with two wonderful finishes late on. Neymar made his PSG debut in the corresponding fixture last season, but apart from his coolly-taken penalty, the Brazil superstar was lacklustre throughout Saturday's clash in Brittany. From undercooking simple passes to poor decision making in the final third, the world's most expensive player must improve if Tuchel's side are to find success on all fronts this term, although Mbappe may change that, of course. - PSG have won their first two games of a Ligue 1 season for the fourth time in a row, after 2015-16, 2016-17 and 2017-18. - Neymar has converted all five of his penalties in Ligue 1. He has both scored and assisted a goal in the same game for the ninth time in Ligue 1 and the first time since 17 February 2018 against Strasbourg. - This Kylian Mbappe's first brace as a substitute in Ligue 1 and the first from a PSG sub in the French league since Edinson Cavani on 19 October 2013 against Bastia. - Guingamp have conceded five penalties in their last eight Ligue 1 encounters with PSG, including the last two. Four of them have been converted. - Nolan Roux has scored for five different teams in Ligue 1 (Brest, Lille, St Etienne, Metz, Guingamp), only Mathieu Bodmer has scored for more amongst current Ligue 1 players (6). Despite the defeat, Guingamp put in a promising display, and will look to build on that when they travel to Lille, while PSG - who will be able to welcome back more big names to the starting XI - host Angers at Parc des Princes.